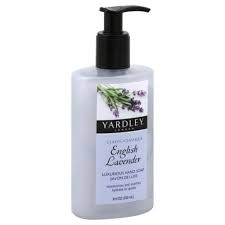 The Yardley London English Lavender Hand Soap is the simple and classic luxury of the English Lavender Botanical soap in a liquid format. It combines the natural bounty of Lavender and essential oils to create an aromatic and therapeutic experience that will leave your hands and face rehydrated, refreshed and deeply moisturized. Water, Sodium Laureth Sulfate, Ammonium Lauryl Sulfate, Cocamidopropyl Betaine, Lauramide DEA, Glycol Stearate, Glycerin, PEG-7 Glyceryl Cocoate, PEG-150 Distearate, Fragrance, Triclosan, PEG-7-M, DMDM Hydantoin, Citric Acid, Tetrasodium EDTA, Sodium Chloride, Blue 1, Red 33.